Saint Mary's is a FAIR TRADE COLLEGE! We are committed to sourcing coffee, tea, chocolate and other products from growers that ensure fair wages, safe working conditions and that use sustainable practices. Fair Trade directly connects with the fidelity of our educational mission, Catholic principles and Lasallian identity. Fair Trade isn't only about chocolate, tea and coffee... your clothing can be Fair Trade too! 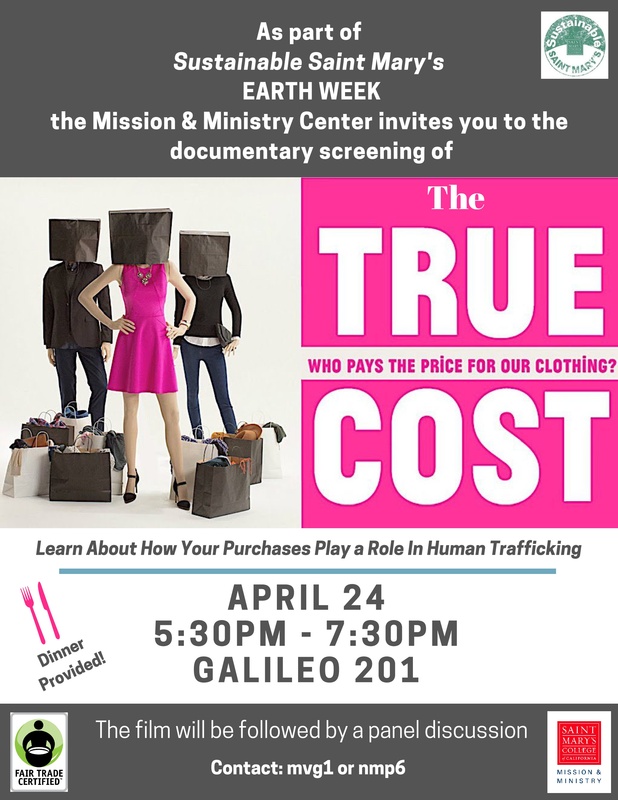 Come watch this film with us, and find out how the fashion industry and your clothing choices have an impact on human trafficking. A Panel discussion will follow the film, and DINNER will be PROVIDED! 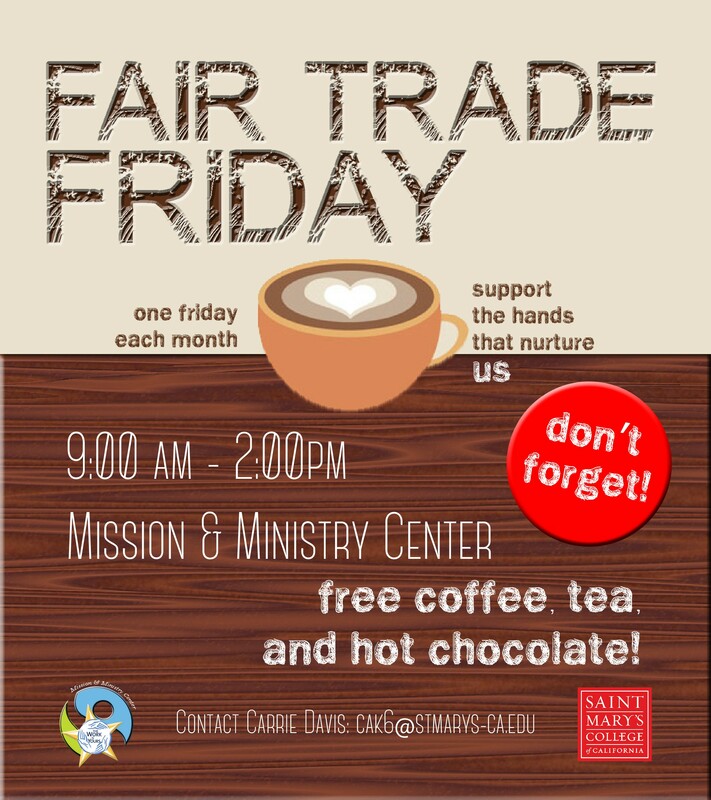 One Friday each month, the Mission and Ministry Center welcomes the SMC community to enjoy free fair trade coffee, tea and chocolate samples, while learning about the importance of Fair Trade. 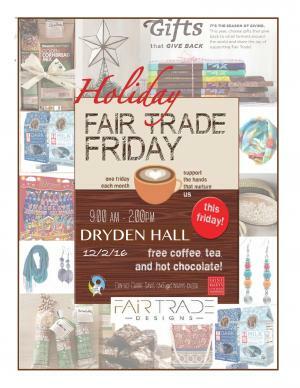 We also have Fair Trade items for sale (cash & check only, please). 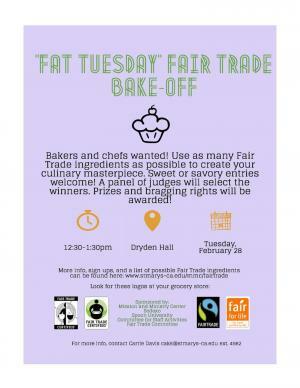 Thank you to everyone who participated in, and attended, the Fair Trade Bake off! Special thanks go out to our awesome judges and the Sodexo staff, particularly Matt Carroll and Chef Anton for providing many of the ingredients for our participants. 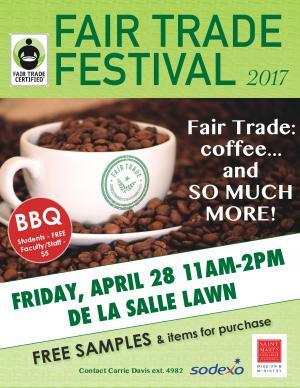 Saint Mary's celebrates it's status as a Fair Trade College with this yearly free Fair Trade Festival, happening on Friday April 28, from 11 a.m. to 2 p.m. Coffee, chocolate, tea, handicrafts, and other Fair Trade goods will be available - both free samples and items for purchase. Enjoy a BBQ - free for students and $5 for faculty, staff, and all other festival guests. 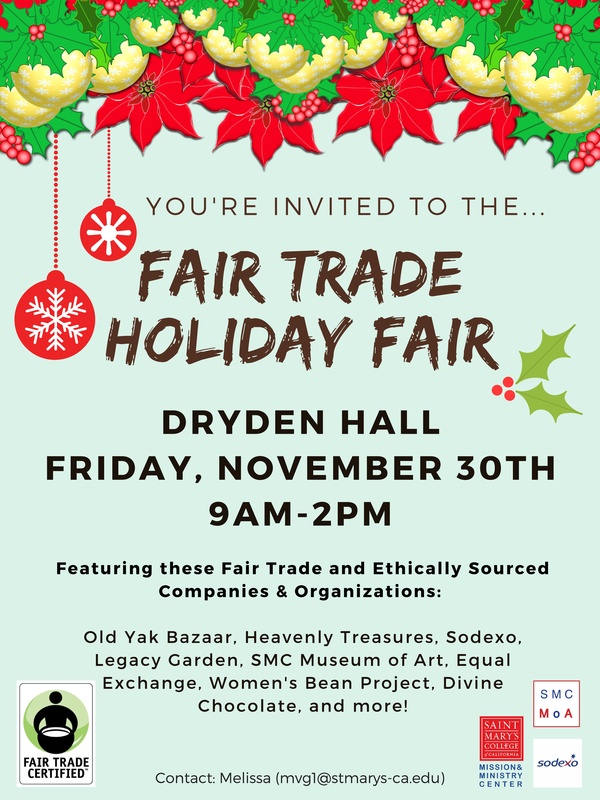 Find out more about Saint Mary's Fair Trade efforts! Find out more about Fair Trade Food here at Saint Mary's! Check out Saint Mary's College's Fair Trade Resolution! Find out more about Catholic Relief Services Fair Trade by clicking here!